Kwatee web application the is package as a standalone executable jar which does not require. an additional servlet container such as Tomcat or Jetty. 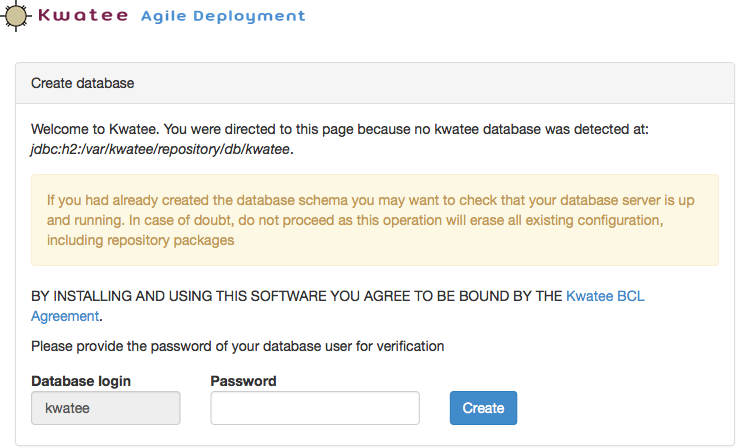 Kwatee uses an internal H2 database by defaut but can be configured to use mysql or postgres and runs any operating system with Java 7 or newer. It has been tested on MacOS, Ubuntu and Windows but will run on any other flavor of linux or unix as well. Kwatee is not very resource intensive so there is no need to dedicate a full server to it's operations. Database Kwatee uses an embedded H2 by default but you may configure it to use MySQL 5.1+ or PostgreSQL 8.4+. Edit KWATEE_HOME/kwatee.properties and customize the properties. FOR WINDOWS: if you choose to replace default paths by windows paths, you must make sure to use double backslashes, i.e. kwatee.repository.path=d:\\kwatee\\repository, or to replace them by forward slashes, i.e. kwatee.repository.path=d:/kwatee/repository. The web interface will guide you through the steps for creating the database schema which will require you to supply kwatee.jdbc.user and kwatee.jdbc.password that must have sufficient privileges for creating users and a database. Once this final step is completed, you'll see Kwatee's login screen. The default administrator user is admin with password password.